There are three standard options for binding print work into Screwpost Binders. While there is no one best solution, each has advantages and disadvantages. The easiest way to decide which inserts are the most appropriate for your presentation is to first rank by importance the following criteria: cost, protection from damage, ease of use, and clarity. Adhesive Hinge Strips are the least costly method of binding prints into a book. To use them, you simply remove the liner and adhere the strip to the edge of your print. You’re basically adding a hinge to the edge of the work so it can be inserted into a screwpost book or binder. The process of applying them can be tricky as they are generally not removable; where they first touch your print, they will stay. While they may be inexpensive, and they allow for a totally unobstructed view of your work, they offer no protection to your prints from damage such as fingerprints and dust. Adhesive Hinge Strips, then, are most appropriate for books with artwork that is relatively replaceable. If you need a solution that is easy to use and provides protection for your work, the Pro-Archive sheet Protectors are an excellent choice. Made in the USA of ultra-clear, scratch-resistant archival polypropylene, these top-loading sheets feature a non-stick finish to prevent adhesion to your artwork. Simply insert your art or documents and you're done. 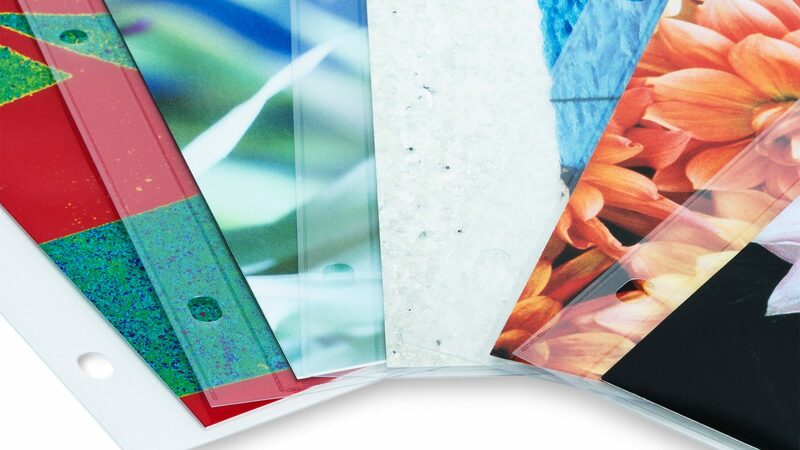 While sheet protectors may have a traditional feel, the simplest and most contemporary approach for binding work into a book is to use inkjet paper that is pre-drilled and scored. You simply print these sheets like you would on any other inkjet paper, then bind them directly into your book using no sheet protector or strip. This is the least costly method of putting together a book because you’re bypassing the sheets or strips entirely, and it offers perfect clarity as there is nothing between the viewer and the work. The disadvantages of the pre-drilled inkjet sheets are, however, that they offer no protection from damage and they can be tricky to use. All manufacturers of such inkjet sheets provide print profiles on their websites with which you should consult before printing.